What goes around, comes around again. Doesn't it? That's been my experience, for sure! 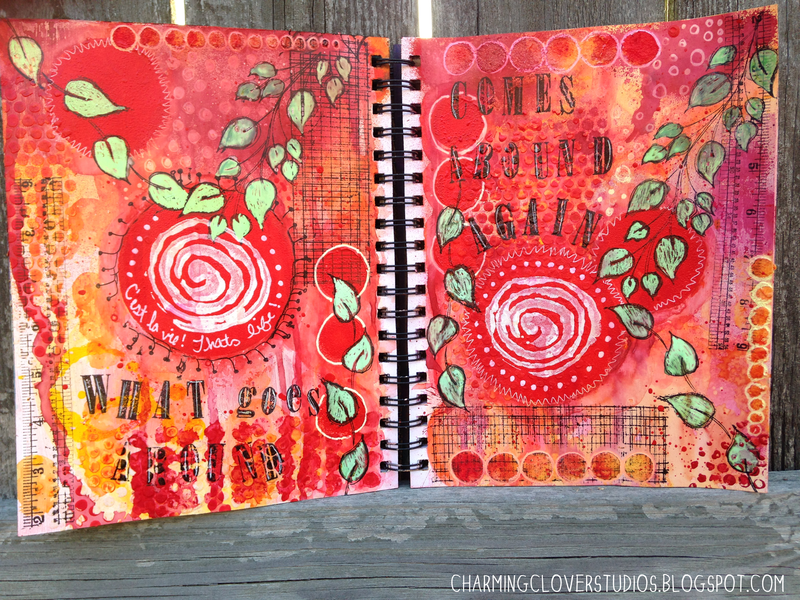 What goes around is the theme for this week's art journal and video! There are a lot of hidden layers in this layout. They were all fun to do and I wish some stayed showing. But that's the fun of Mixed Media. You get to try all sorts of things. If you don't like it, cover it up. If you cover up something you love - you still know it's there. And hopefully you took a video or pictures! Soft (chalk) Pastels make a huge mess! They're so much fun though! Blend! Blend! Blend! A paper towel works to blend them, but it's really too rough - it'll leave little pieces of paper behind. Use a facial tissue - you get a much softer (and better) blend that way. Be gentle - it's not brake dust! After finishing any layer of chalk and/or oil pastels - FIX IT!!!! Spray it with either a Workable Fixative or Hair Spray. You'll save yourself a lot of headache later. Some chalk will still come off, but it won't be anything like it would be if you didn't spray it. SPRAY OUTSIDE! And wait at least half an hour before adding your next layer. Souffle Pens are very transparent when you first put them down - let them dry and see what happens! I originally used Dylusions Ink Spray in Cut Grass to color in the leaves, but it just wasn't bright enough (i.e. opaque) to really stand out against all that red. By using a green Souffle Pen, I got the bright green color and level of opaqueness I was happy with. *Canson Mix Media XL Series 7x10"
I really enjoyed this layout and I hope you did too! Happy painting y'all!